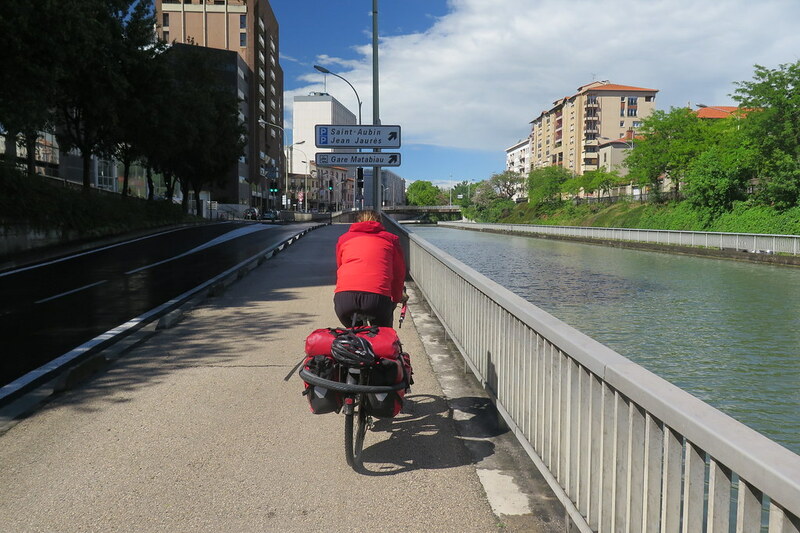 We didn’t want to ride much further, as getting closer the city could have made it tricky to wild camp. 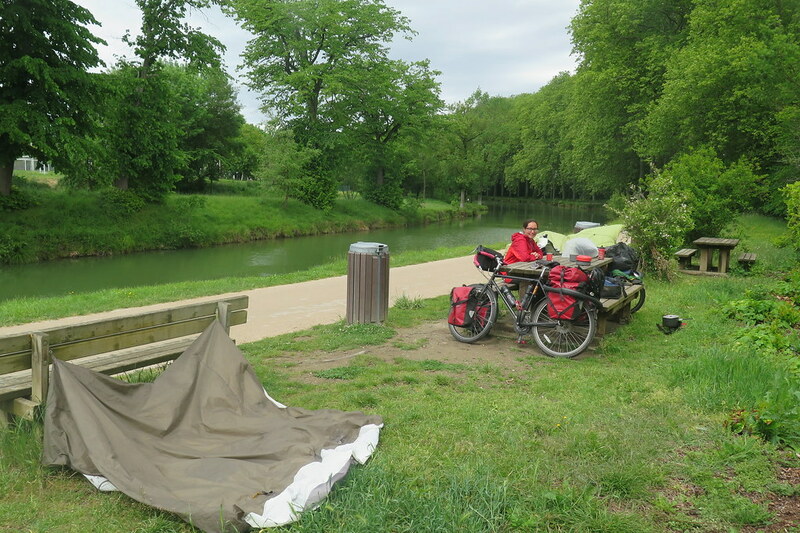 We turned off the main road to head down towards the Canal du Midi, but on the way we crossed a bridge over the River l’Hers and saw a spot in the trees which was sheltered from the wind by a big stone bridge. We were quite well hidden so put the tent up straight away while we had a break in the drizzle. It seemed like a good spot, until a tractor started plowing up and down the field next to us. We thought he’d probably see us, so I was prepared to get out to try and talk with the guy and hope he wouldn’t mind us camping there. 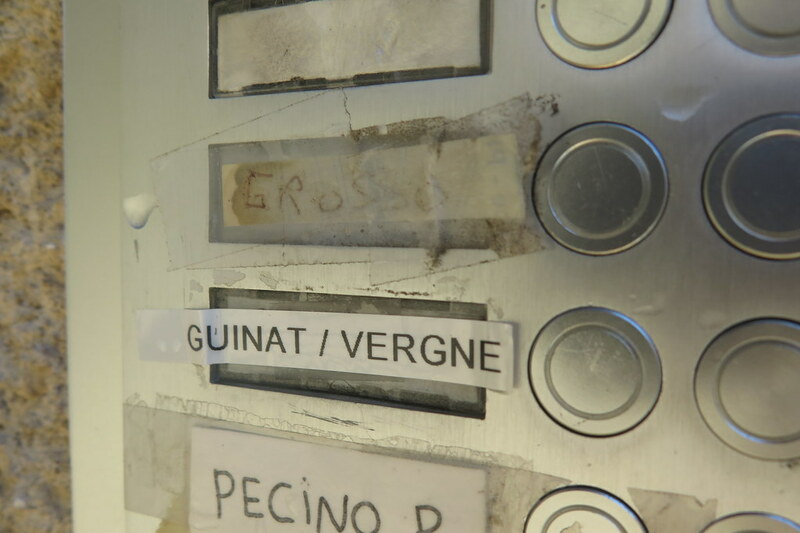 But, even though he was working for a couple of hours, until after dark, he didn’t see us. I guess we were just far enough into the trees, and our faded green tent blended in with the foliage around us. 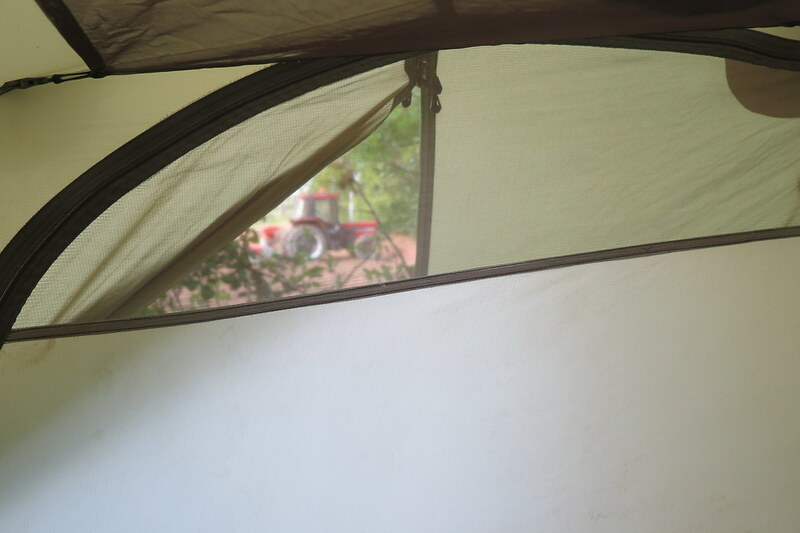 The rain continued through the night so in the morning the tent was wet. We waited for a while for the sun to come out, but the clouds still looked quite thick, so we packed up after a slow breakfast and headed off. 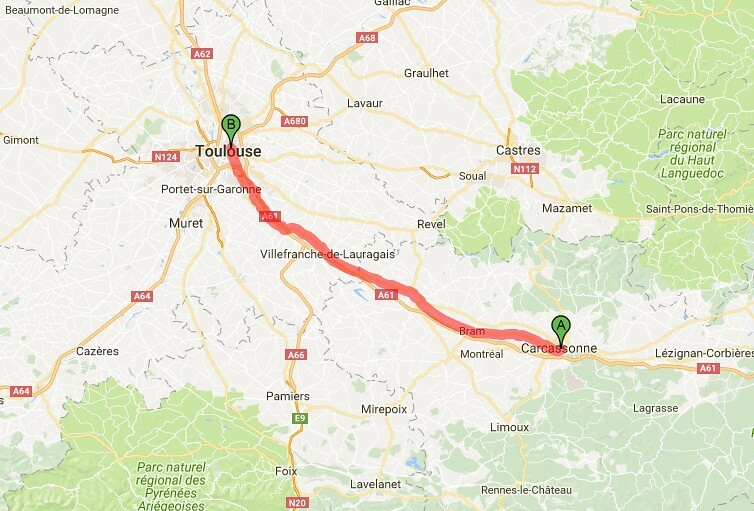 With the easy distance the previous day, we only had about 30km to get to Toulouse where we were going to be staying with Tim and Claire, our cycling friends from Central Asia. Tim wasn’t going to be back at their place until 5:00 that afternoon, so we had some time to kill. 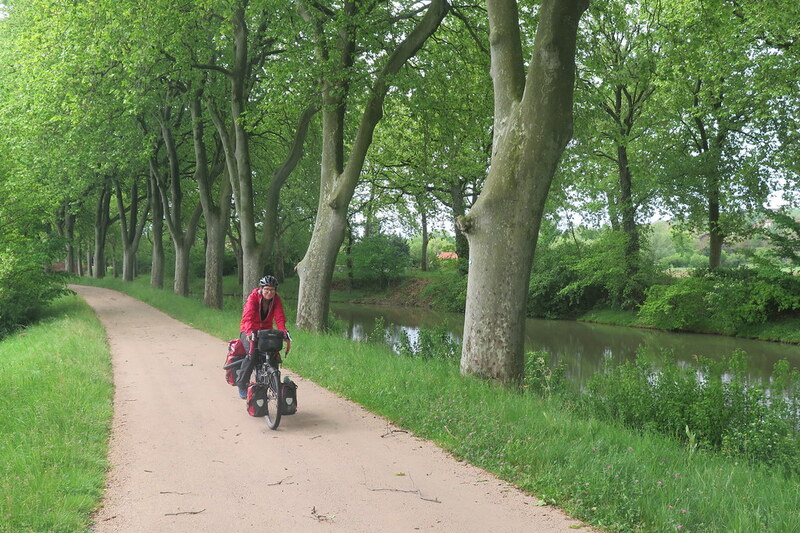 We followed the canal cycle path which, for this stretch was sealed, smooth and wide. In some of the sections we’ve seen it’s quite overgrown and muddy, but this was great, and it took us right past Tim and Claire’s place. Late in the morning the clouds started breaking up and we decided to have a tea break and to get the tent out to dry. We didn’t plan on camping again for a little while, so didn’t want to leave it packed up all wet. The tea break turned in to a lunch break and a very pleasant few hours relaxing by the canal when the sun came out. It was a Saturday and the path was busy with cyclists, some of them loaded with panniers. 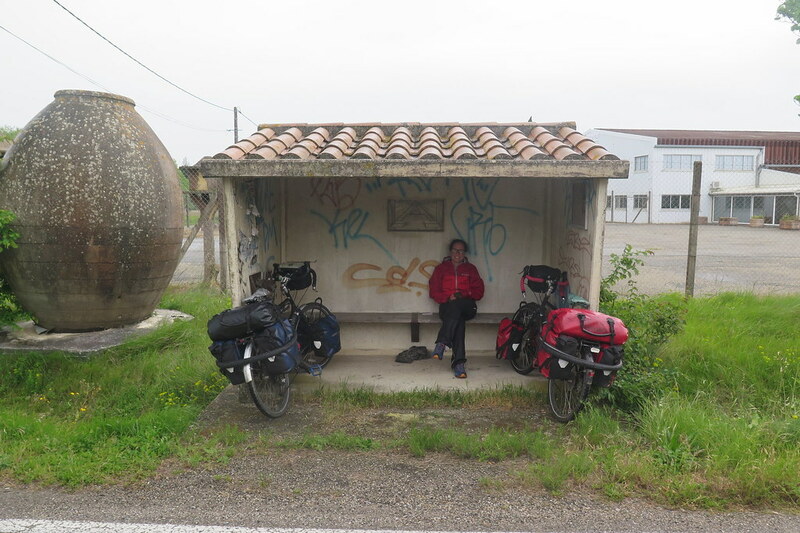 We met a Belgian couple doing a 6 week tour of France, but other than them, not many seemed too interested in chatting. 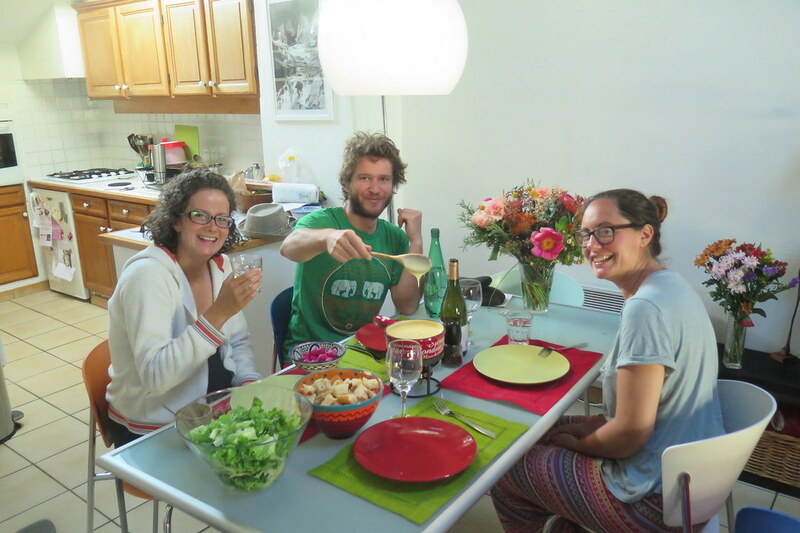 We managed to while away a few hours talking, doing crosswords and drinking tea. 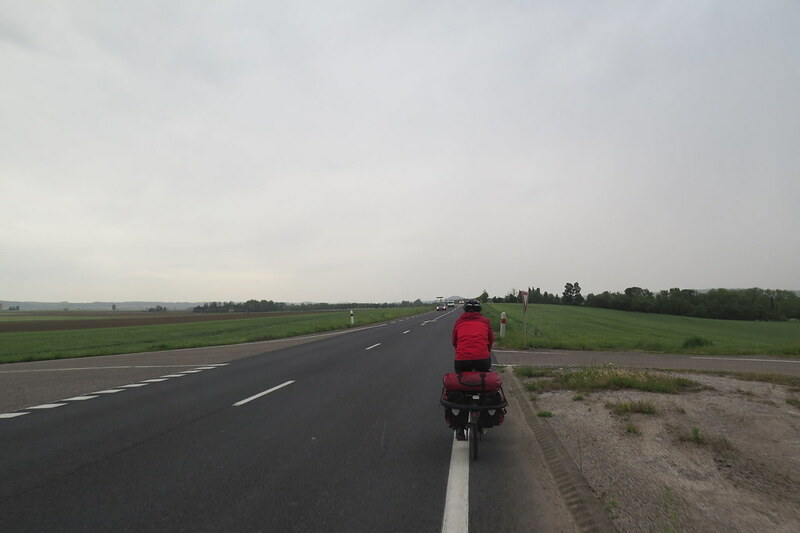 We set off again in the afternoon, still riding slowly and still following the cycle path. 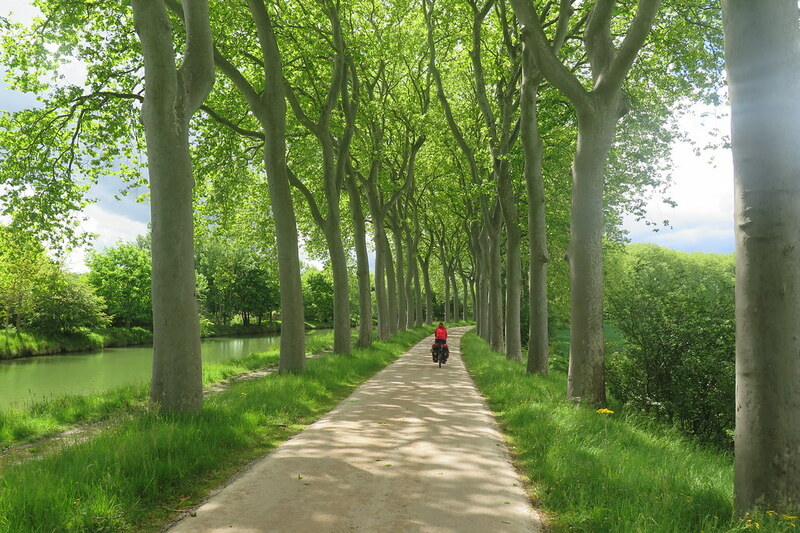 It’s really carefree cycling, not thinking about traffic or hills, just coasting along between the trees. 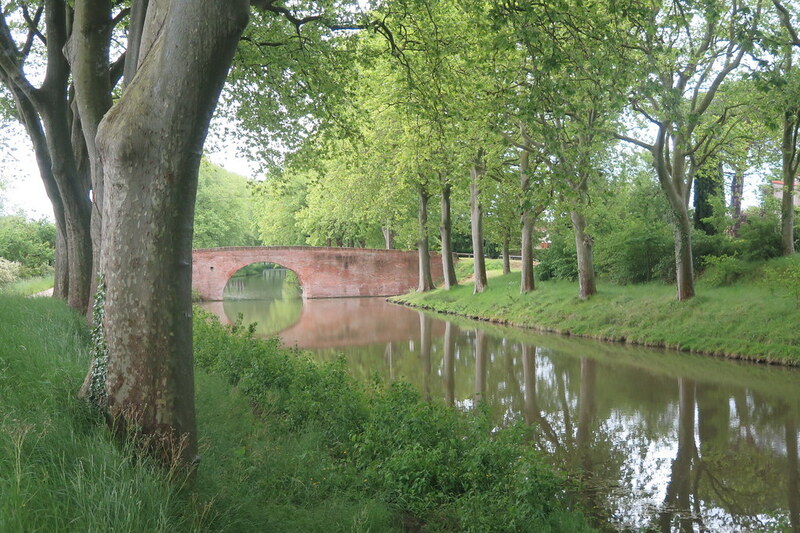 We’re looking forward to following more of this canal route beyond Toulouse to Bordeaux. Before we knew it, we were in the city, the path took us right into the centre. 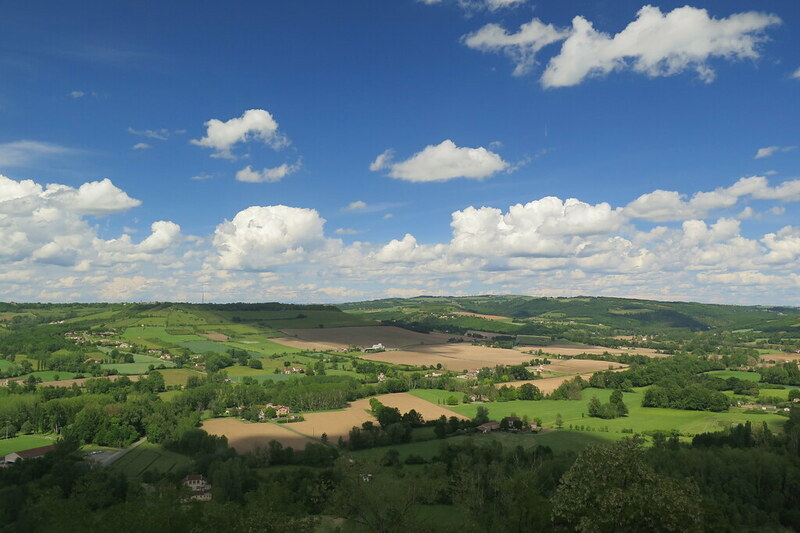 We turned off and within a few hundred metres we’d arrived. We’d got there a bit early, so sat in the sun for a bit waiting for Tim to get home. 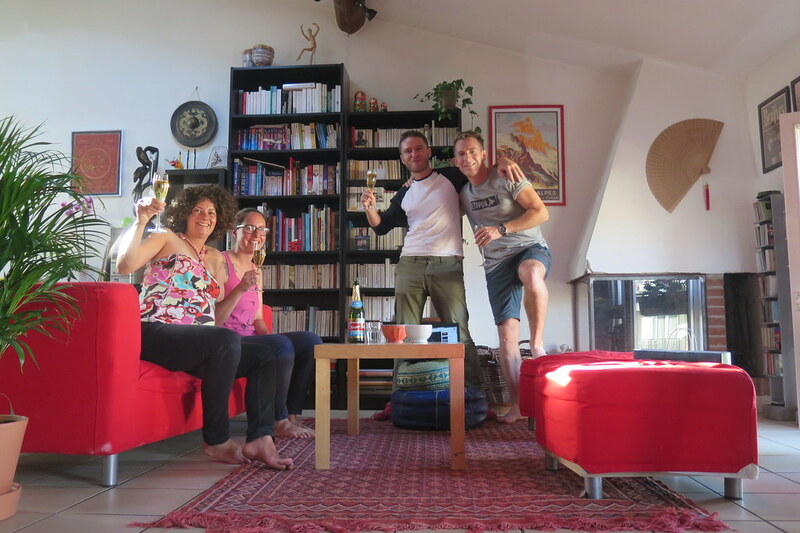 Although we saw Tim and Claire the weekend before in Montpellier, it was really nice to get to their place and see them again, something we’d been planning ever since we went our seperate ways back in September last year. 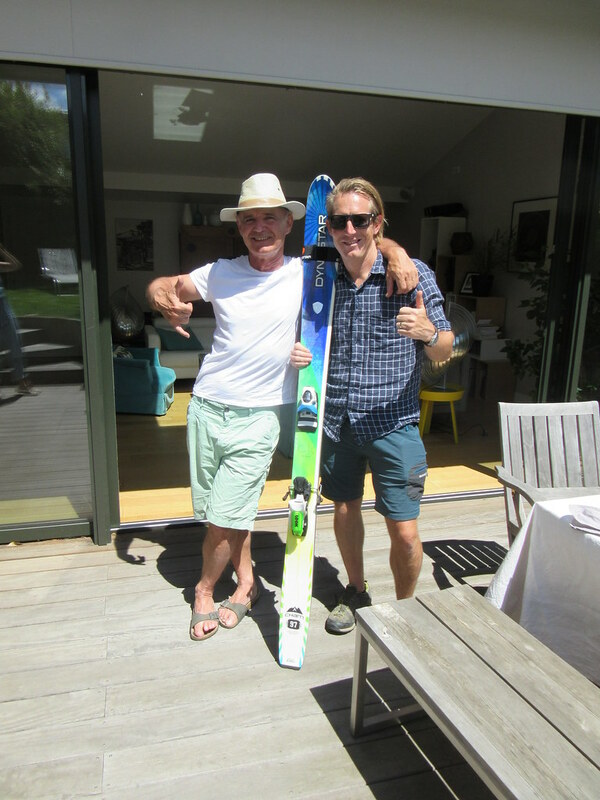 Tim introduced us to his family, and I immediately bonded with his Dad over a shared love of skiing. 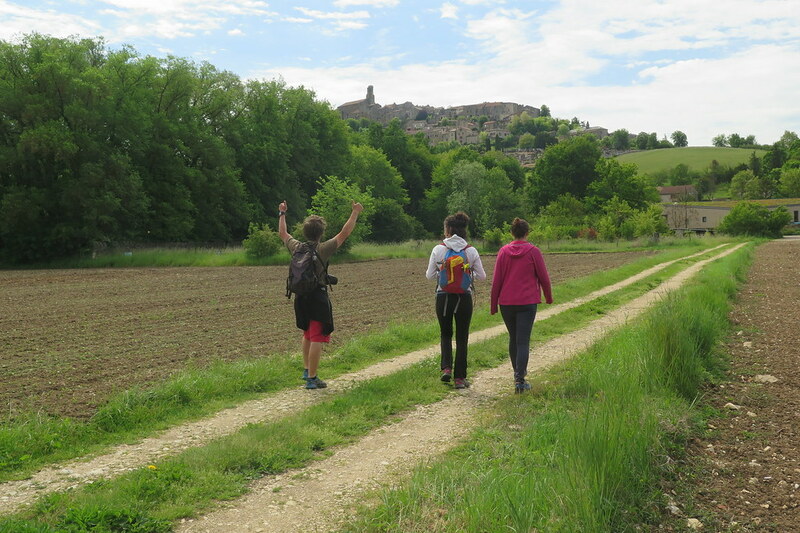 We also went out for a long walk around a little village called Cordes sur Ciel at the weekend. 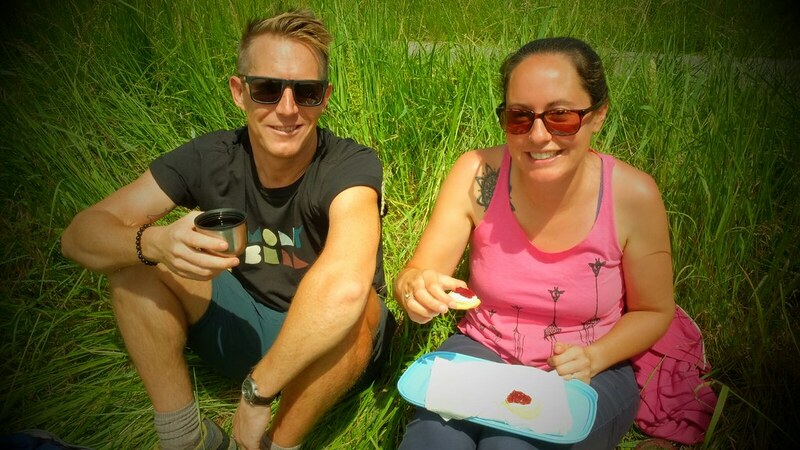 A very mellow 10km in the hills, nothing compared to what we all did in the Tajik mountains, but impressive considering Claire is now 7 months pregnant. 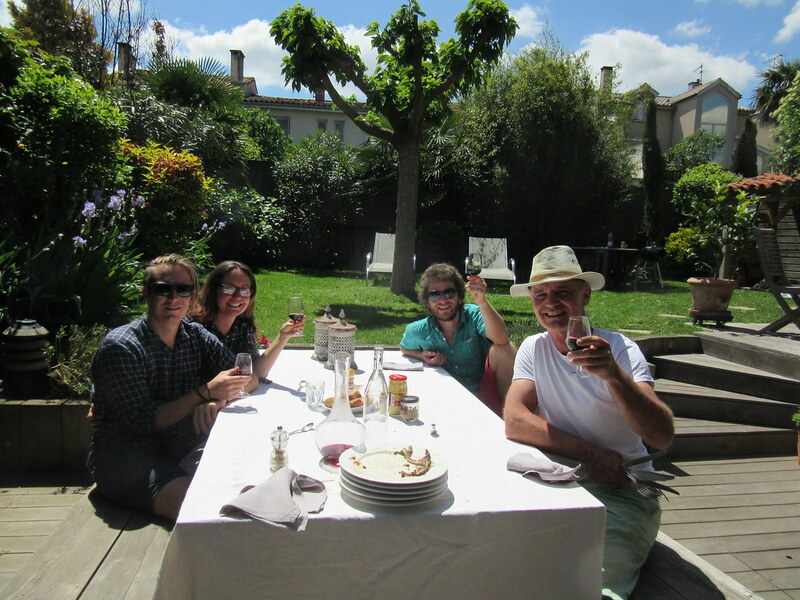 It’s been a lovely week with some very good friends who we look forward to hosting back in the UK. And now back to cycling. The reality that we’re close to the end of our trip has definitely dawned on us. From here, we’ll ride to the Atlantic then turn right, to head north towards home. 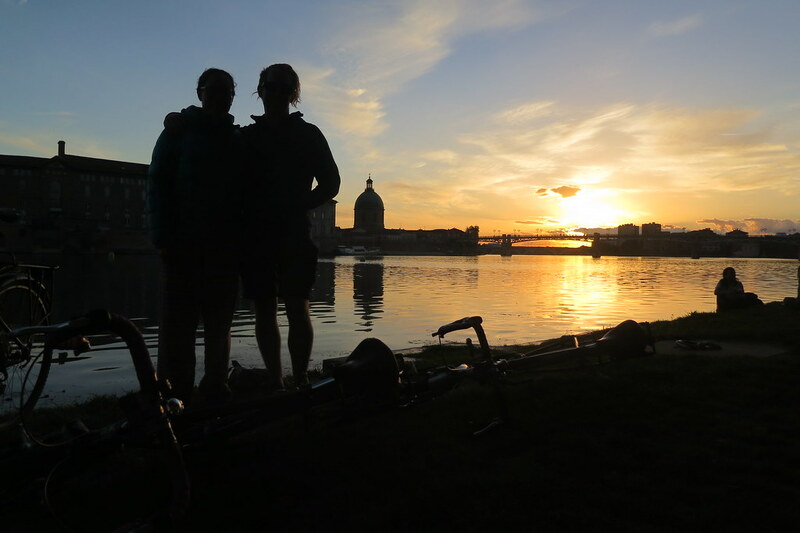 We’ve even set a date of June 23rd that we’ll reach the UK, to finish riding at my parents’ place on the 24th. In many ways it feels like we’ve been riding forever, but it also feels like we only set off a few days ago. We’ll be making the most of our last weeks on this trip, but also we’re looking forward to the future.